Our site feedback form requires users to give us contact information (eg their name and email address) so we can respond to their comments. We do not control the use of your personal information you may share with our linked sites. You are advised to make yourself aware of their terms and conditions in this respect, if any. We undertake not to sell your name and/or personal data to third parties, and do not intend to do so in the future. This Site is owned and operated by Skytrax Research. Airline Flat Seat Ranking, Quality Approved Airlines and other selected site features are trademark and copyright protected. No material from this Site may be reproduced, re-published, transmitted, or distributed in any way, without prior written consent of Skytrax. 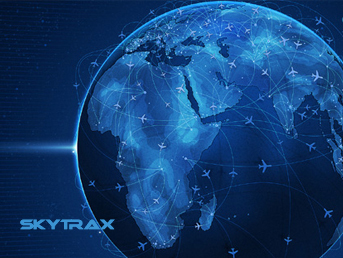 In event of any information reproduction (which has to be prior approved in writing by Skytrax) you must keep intact all copyright and allied proprietary notices, pertaining to both Skytrax or any other nominated source. Graphics and images may not be reproduced or used in any manner without prior written permission of Skytrax. Modification of any materials, or use of materials for any other purpose is a violation of site copyright and allied intellectual property rights. You may not redistribute, sell, or otherwise deal with information contained on the site without prior written consent of Skytrax. This Site is compiled in good faith by Skytrax, but no representation is made / warranty given as to the accuracy of information. Skytrax have no liability for consequential damage that may result from the use of, or inability to use information in the Skytrax site. Any Skytrax publication shown in this site may contain technical / typographical errors. This site has links to web sites that are not maintained by Skytrax is not liable for any damage arising from use of these other web sites. Our links to other web sites do not demonstrate approval of these sites or association with their owners. All link web sites are used at your own risk. If you do not agree to the above terms, please discontinue usage of our site or contact us for further information.